Welcome to Workout-Routine.com, the website dedicated to all things related to workout routines and fitness programs. If you are serious about your workouts and want your time spent exercising to be more productive you will find this site quite useful. You'll find more than 50 different workout routines that you can use to help you reach your fitness objectives. These fitness programs are organized by the main equipment they use (dumbbells, barbell, etc.) and for each you'll find several different routines with different goals. To start browsing for workout routines simply use the menu on the left side. On this page you'll find a fine selection of workout equipment that you can review and buy in order to perform the workout routines found on this website. 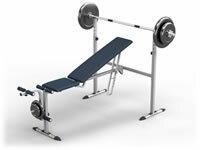 You'll find a variety of free weight devices as well as gym-type equipments. What do the terms reps and sets mean? A rep is a contraction of the word repetition, which refers to the number of times you should execute an exercise consecutively without taking a break. A set simply refers to the number of sequences of repetitions that you should do before moving on to another exercise. One of the most frequently asked question you'll hear is, "how much weight should I lift for that particular exercise?" Because people come in all shapes and sizes (and muscle strength levels), it's impossible to give a useful answer other than the rule of thumb that follows. The optimal weight for an exercise is the one where you'll be able to finish all repetitions in your sets without having enough energy left to do several others beyond that number. For example, if you are doing the bench press exercise and you are seeking a muscle power objective (3 sets of 6 reps), you should try to find the weight plate configuration that will allow you to barely finish all 6 repetitions before taking a break and continuing on to the next set. If you find yourself unable to complete the 6 repetitions in a row for any set it means you are using too much weight and should remove some until you are able to complete your sets. Conversely, if you find yourself breezing through your sets and repetitions without breaking a sweat and feel you could do several more after the set is complete, it probably means you could add more weight for that exercise. The objective here is to find that initial sweet spot for each new exercise and in no time you'll see yourself gradually increasing the weight in a predictable and safe manner as your muscles grow stronger. How many sets and/or repetitions should I use for my exercises? This objective is generally reserved for muscles you don't use for long periods of time during your normal daily activities but for which you need explosive strength for when they are being used or simply because of aesthetic reasons. For that reason, a workout routine regimen of 3 sets of 6 reps will allow your muscles to bulk up visibly and gain that explosive power for when you need it. 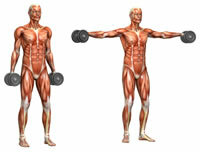 The general muscle strength objective is ideal for muscles where general fitness is being pursued. Employing a workout routine regimen of 3 sets of 10 reps will allow your muscles to gain general strength (neither explosive power nor long haul endurance). The muscle endurance objective is usually best pursued for muscles that you constantly use throughout the day and for long periods of time. For those muscles, explosive power and size is not ideal as their input will be requested on a low intensity level throughout the day and as such employing a workout routine regimen of 4 sets of 16+ reps can be employed instead. What guidelines should I follow regarding using proper form? Because you're effectively moving weight around when exercising with workout routines it's important to make sure you're using proper form. Use the following guidelines to reduce the risk of injury and reduce the risk of damaging your fitness equipments. - When picking up weights from the floor be sure to do it in a slow fashion, bending your knees and making sure that your back and arm muscles are contracted. This will reduce the chance that you will catch your muscles off guard upon soliciting them. - When performing a repetition for a given exercise try to perform the required movements in a slow and steady fashion instead of doing quick bursts. - Finally, it is generally good practice to contract the muscles being targeted by an exercise just prior to starting the movement required by a repetition. This is particularly important when really pushing yourself by using a large amount of weight. What are safety precautions I should take? It's generally good practice to warm up your muscles lightly before engaging them in intense training with the exercises proposed by your workout routines. One of the easiest and most effective ways of warming up is to simply perform the movements required by an exercise by using a low amount of weight, much lower than what you would end up using. Personal trainers will also usually recommend that you stretch your muscles either before or after working out (or maybe both). This will reduce muscle tension and will promote more fluid ranges of motion.